Psytronik Software in association with RGCD present a superb compilation featuring three full games from The Mojon Twins - Uwol, The Quest For Money, Nanako in Japanese Monster Castle and Sir Ababol! 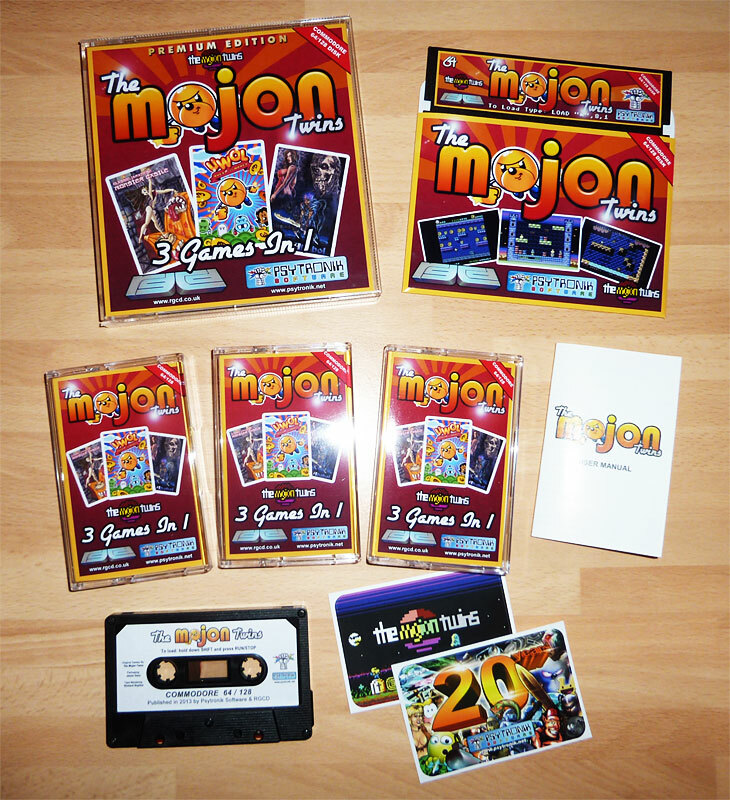 The compilation is now available from Psytronik as a Premium C64 disk (presented in a clear plastic 5.25" case with glossy printed artwork), a budget C64 disk (presented in a glossy colour disk sleeve with full colour label) and on tape (presented in a clear cassette case with full-colour glossy inlay). The tape & disk versions also include a user manual along with a FREE vinyl sticker! The games are also available on C64 cartridge via our friends over at RGCD. Uwol is on a quest ... for MONEY! And it’s up to YOU to help him swell his coffers and make him RICH! But your task won’t be easy, as the money is being closely guarded by assorted meanies along with a spooky ghost that will chase you if you take too long to collect the coins! This is the story of Nanako, who is on a quest to rescue her witch apprentice sister Mya from the Heún Tower. Mya had disobeyed her mentor's orders, and broke all the palace rules in order to vist the Heún Tower - as she wanted to improve her knowledge in dark magic. Now it is up to Nanako to rescue to her sister, and avoid the army of Karakasas that stand in her way. An unfortunate happenstance left poor Sir Ababol without his sword. The only way for him to retrieve his beloved blade is to collect wild poppies, scattered throughout the various screens in this arcade adventure - only then will his sword be returned to him. There is questing to be done, and it is up to you, Sir Ababol, to do it! • 3 full Commodore 64 games! • Fun arcade platform action! • Great music and presentation! • Superbly detailed hi-res sprites!